Environment Impact Assessment (EIA) report is mandatory for industrial and infrastructure projects. Conflict of interest ridden NGO Quality Council of India (QCI)/National Accreditation Board of Education and Training (NABET) and EIA consultants accredited by it is also mandatory for it splits the facade of environmental governance wide open. The Department of Industrial Policy & Promotion, Union Ministry of Commerce & Industry, is the nodal ministry for QCI, not the Environment Ministry. This state of affairs appears to be engineered by the Cabinet Committee of Economic Affairs and the Prime Minister. The industrial and infrastructure projects that need to have EIA reports are listed in the 43 page EIA notification, 2006 under sub-rule (3) of Rule 5 of the Environment (Protection) Rules, 1986 framed under the Environment (Protection) Act, 1986 for imposing certain restrictions and prohibitions on new projects or activities, or on the expansion or modernization of existing projects or activities based on their potential environmental impacts. Under the notification, an application seeking prior environmental clearance in all cases is made in the prescribed Form 1, Supplementary Form 1A and Appendix II under EIA Notification after the identification of prospective site(s) for the project and/or activities to which the application relates, before commencing any construction activity, or preparation of land, at the site by the applicant. The applicant is required to furnish, along with the application, a copy of the pre-feasibility project report except that, in case of construction projects or activities (item 8 of the Schedule) in addition to Form 1 and the Supplementary Form 1A, a copy of the conceptual plan shall be provided, instead of the pre-feasibility report. Stage (1) of "Screening" refers the scrutiny of an application seeking prior environmental clearance. determine detailed and comprehensive Terms Of Reference (TOR) addressing all relevant environmental concerns for the preparation of an Environment Impact Assessment (EIA) Report in respect of the project or activity for which prior environmental clearance is sought. This has to be conveyed to the applicant within sixty days of the receipt of Form 1. If the Terms of Reference are not finalized and conveyed to the applicant within sixty days of the receipt of Form 1, the Terms of Reference suggested by the applicant is deemed as the final Terms of Reference approved for the EIA studies. The approved Terms of Reference is displayed on the website of the Ministry of Environment and Forests and the concerned State Level Environment Impact Assessment Authority. Applications for prior environmental clearance can be rejected by the regulatory authority concerned on the recommendation of the EAC at this stage itself. In case of such rejection, the decision together with reasons for the same has to be communicated to the applicant in writing within sixty days of the receipt of the application. Stage (3) of Public Consultation refers to the process by which the concerns of local affected persons and others who have plausible stake in the environmental impacts of the project or activity are ascertained with a view to taking into account all the material concerns in the project or activity design as appropriate. The Public Consultation shall ordinarily have two components comprising of a public hearing at the site or in its close proximity- district wise for ascertaining concerns of local affected persons and to obtain responses in writing from other concerned persons having a plausible stake in the environmental aspects of the project or activity. The public hearing at, or in close proximity to, the site(s) in all cases is supposed to be conducted by the State Pollution Control Board (SPCB) or the Union territory Pollution Control Committee (UTPCC) concerned in the specified manner and forward the proceedings to the regulatory authority concerned within 45(days of a request to the effect from the applicant. After completion of the public consultation, the applicant is supposed to address all the material environmental concerns expressed during this process, and make appropriate changes in the draft EIA and EMP. The final EIA report, so prepared, is to be submitted by the applicant to the concerned regulatory authority for appraisal. The applicant may alternatively submit a supplementary report to draft EIA and EMP addressing all the concerns expressed during the public consultation. Stage (4) of Appraisal means the detailed scrutiny by the Expert Appraisal Committee of the application and other documents like the Final EIA report, outcome of the public consultations including public hearing proceedings, submitted by the applicant to the regulatory authority concerned for grant of environmental clearance. On conclusion of this proceeding, the Expert Appraisal Committee or State Level Expert Appraisal Committee concerned is supposed to make categorical recommendations to the regulatory authority concerned either for grant of prior environmental clearance on stipulated terms and conditions, or rejection of the application for prior environmental clearance, together with reasons for the same. 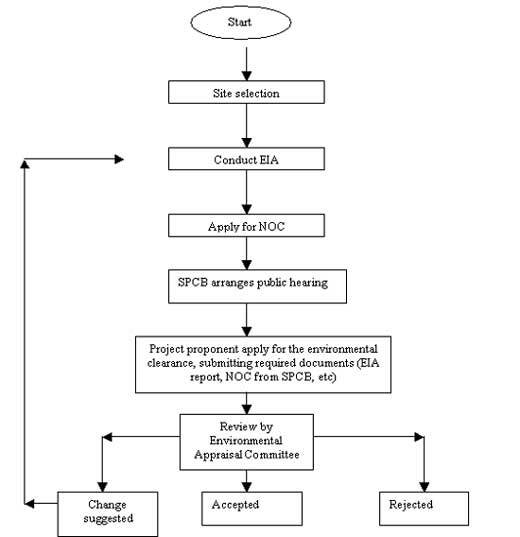 The regulatory authority considers the recommendations of the EAC or SEAC concerned and conveys its decision to the applicant within 45 days of the receipt of the recommendations of the Expert Appraisal Committee or State Level Expert Appraisal Committee concerned or in other words within 105 days of the receipt of the final Environment Impact Assessment Report, and where Environment Impact Assessment is not required, within 105 days of the receipt of the complete application with requisite documents, except as provided below. In the event that the decision of the regulatory authority is not communicated to the applicant within the period specified in sub-paragraphs (i) or (ii) above, as applicable, the applicant may proceed as if the environment clearance sought for has been granted or denied by the regulatory authority in terms of the final recommendations of the Expert Appraisal Committee or State Level Expert Appraisal Committee concerned. On expiry of the period specified for decision by the regulatory authority under paragraph, the decision of the regulatory authority, and the final recommendations of the Expert Appraisal Committee or State Level Expert Appraisal Committee concerned is supposed to be public documents. Deliberate concealment and/or submission of false or misleading information or data which is material to screening or scoping or appraisal or decision on the application makes the application liable for rejection, and cancellation of prior environmental clearance granted on that basis. Rejection of an application or cancellation of a prior environmental clearance already granted, on such ground, is decided by the regulatory authority, after giving a personal hearing to the applicant, and following the principles of natural justice. The “Validity of Environmental Clearance” is meant the period from which a prior environmental clearance is granted by the regulatory authority, or may be presumed by the applicant to have been granted to the start of production operations by the project or activity to which the application for prior environmental clearance refers. The prior environmental clearance granted for a project or activity shall be valid for a period of 10 years in the case of River Valley projects, project life as estimated by Expert Appraisal Committee or State Level Expert Appraisal Committee subject to a maximum of 30 for mining projects and 5 years in the case of all other projects and activities. In the case of Area Development projects and Townships, the validity period is limited only to such activities as may be the responsibility of the applicant as a developer. This period of validity may be extended by the regulatory authority concerned by a maximum period of 5 years provided an application is made to the regulatory authority by the applicant within the validity period. In this regard the regulatory authority may also consult the Expert Appraisal Committee or State Level Expert Appraisal Committee as the case may be. Post Environmental Clearance Monitoring is mandatory for the project management to submit half-yearly compliance reports in respect of the stipulated prior environmental clearance terms and conditions in hard and soft copies to the regulatory authority concerned, on 1st June and 1st December of each calendar year. All such compliance reports submitted by the project management are public documents. Copies of the same is to be given to any person on application to the concerned regulatory authority. The latest such compliance report is also be displayed on the web site of the concerned regulatory authority. A prior environmental clearance granted for a specific project or activity to an applicant may be transferred during its validity to another legal person entitled to undertake the project or activity on application by the transferor, or by the transferee with a written “no objection” by the transferor, to, and by the regulatory authority concerned, on the same terms and conditions under which the prior environmental clearance was initially granted, and for the same validity period. No reference to the Expert Appraisal Committee or State Level Expert Appraisal Committee concerned is necessary in such cases. EIA has now been made mandatory under the Environmental (Protection Act, 1986 for 29 categories of developmental activities involving investments of Rs. 50 crores and above. But what is sad and what is clear from the above facts that the EIA report is prepared by the project proponent, the applicant. The consultants who prepare it are hired by the project proponent, this turns the existing framework of "EIA" as a shameless exercise of self-assessment by the companies in questions wherein the Consultants are not liable for their acts of omission and commission. What environmental groups has been demanding is a cumulative EIA which is not conflict of interest ridden. 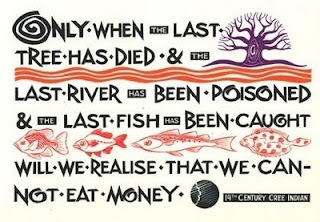 Jairam Ramesh in his role as Union Minister for Environment and Forests had admitted it at the CII-Green Business Centre. He had promised that the Ministry will seeks a third party EIA for power, coal and multi-sector projects. Clearly, the it is part of Ministry's wisdom that the present system is deeply flawed. With effect from October 1, 2011, only those Consultants who are accredited as the EIA Consultants with Quality Council of India (QCI)/National Accreditation Board of Education and Training (NABET)can appear before the central Experts Appraisal Committee and State Level Experts Appraisal Committee (EAC) constituted by the Central Government and State Government respectively. The accreditation is valid for specified period which cannot exceed more than three years. The Environment Impact Assessment (EIA) Consultants and EIA Coordinators can engage only for the approved sectors by the QCI. A to this effect was issued by Dr P B Rastogi, Director, Impact Assessment Division, Union Ministry of Environment & Forests on September 30, 2011. (http://moef.nic.in/downloads/public-information/OM_IA_NABET.pdf) 100 such consultants have been given and the application of 101 consultants is under consideration. 97 Aquagreen Engineering Management Pvt. Ltd. There is a list of 65 Consultants with provisional Accreditation as well. The current fate of R.K. Consultants, Jodhpur which prepared more than 100 EIA reports was barred from preparing EIA reports due to its acts of omission and commission on March 30, 2011 reveals how consultants are accredited. The bar was withdrawn on May 30, 2011. Now its Accreditation is in process. There are several names which have been given Accreditation whose EIA reports have been exposed by researchers still they are listed. What happened to Ministry's promise for a third party assessment? Is this the way to identify, examine, assess and evaluate the likely and probable impacts of a proposed project on the environment and to work out remedial action plans to minimize adverse impact on the environment? Silence of Jairam Ramesh who is a member of CCEA along with the Prime Minister is deafening. Will the Environment Ministry explain why its environmental clearance SITE http://www.ecprocess.nic.in/ or related links on its website rarely work? The applications from the following consultant organizations have been received by QCI and are under different stages of processing. Stakeholders desirous of giving any feedback about the consultant organizations may do so by writing to Director, NABET. The feedback would be taken into account while accreditation decisions are made. 46. 20-Oct-11 JB Enviro Consultants Pvt. Ltd.
NGO Quality Council of India (QCI) and its National Accreditation Board of Education and Training (NABET) seem to be front offices of Associated Chambers of Commerce and Industry of India (ASSOCHAM), Confederation of Indian Industry (CII) and Federation of Indian Chambers of Commerce and Industry (FICCI).